I hope you all had a great weekend!! Here’s a laid back look I wore over the weekend. During the day I wore my black Hunter boots and then swapped them out with a bootie for dinner with Drew. I love looks that can be both dressy and casual! Beautiful casual look. I love the shirt and the cute heels! Shoes make all the difference! I love your shirt and your bag! Perfect look, love your bag! You look stunning! I’m in love with your grey pants, on my trip to paris I saw all the Parisiennes wearing grey denim. Your Vaneltino bag is a work of art! I love this laid back look! Gorgeous! Lovely outfit Rach! Those booties are my fave! Have an awesome week! Great, classic look! I also love your hair straight like that! So comfy and totally chic. Love how you look so great being pregnant.. it’s not easy!! Love the look, it seems so cozy yet cute. Such a cute look! Love the glasses. Love, love, love! Simple and casual, yet very put together. You look gorgeous as always! Your hair looks amazing! I’m interested in what you use to get the sleek shine! Gorg as always!! Loving those booties.. I also love that kind of versatile looks. Happy monday to you too Rach…! Great casual look. Love the booties! I love this outfit! Your hair looks great, too! http://trendkeeper.me .. Talking Monday motivation! Love the mix of denims! Love your gray jeans especially paired with a classic chambray top!! I need a good, new chambray. I love the look of yours here. Obsessed with those jeans! Love this whole look. Great look Rachel! Love the Denim on Denim, so relaxed and chic. I love the grey denim with your chambray! Gotta love when you only have to switch shoes to dress up the outfit! Love your booties. I just want your entire purse collection, they’re all so fabulous! One of my favourite looks. Love this denim on denim. You look beautiful! Great casual look – I wasn’t sure how I felt about the peep-toe shootie when it first came out, but I’ve seen it styled so many awesome ways that I want a pair now!!!! Goooo shooties! Love the touch the scarf adds! This look is so lovely! Those jeans are rockin, girl! Love them! You look so happy and beautiful!! Love chambray and gray! Very cute look! I love how you’ve created the perfect marriage of Preppy and Edgy chic. The Burberry scarf looks so pretty draped across your studded Valentino bag. I tell ya… you pull off everything so well! I stumbled across your blog back in 2012 and have been an avid follower ever since. I don’t always comment, but I’m always impressed. Very happy for you, looks like you have a great life…and it’s nice that you open up to share your style and home decor tips! Today’s Post:Weekend Passed. Hello Monday. Love the mix of denim here! 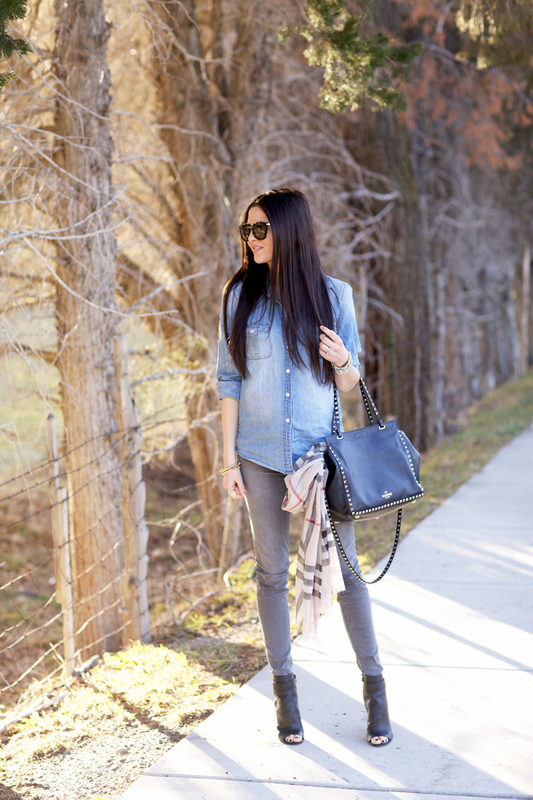 Love the Vince booties and chambray top. J.Crew and Madewell always have great options for chambray and denim tops. Isnt pregnancy hair the best? So shiny and thick. Shame it all falls out again. Enjoy it while it lasts. You look great. You look so beautiful! Love that growing baby bump. Those Vince booties will always be my favorite!! Such a great laid back look and I love the pop of print from the Burberry scarf! I wore an outfit quite similar to this yesterday! I’m not sure how I survived before I bought grey jeans, they’re my fav! You have the best style! Love everything about this outfit! Gorgeous outfit! SO simple and so stylish! I love the chambray paired with grey denim! Those Vince booties are my favorite!! I like hearing the different shoes that you wear for day and night. Shoes can completely change a more laid back look from day to night. I also love your scarf tucked into your fabulous bag. I adore scarves and it’s another great way to add style! Beautiful!! I Love this look. Especially the shoes. I love this laid-back look on you! You are the most beautiful pregnant woman! Hi Rachel, do you wear some kind of elastic waistband over your jeans button ? if not how do you button them up with a growing belly ? How do you keep your designer shoes in such good condition? Red bottoms always look so fresh! Great casual chic style with denim pieces and cool accessories! Love the studded bag, very classy piece with a touch of edge! Love this look Rach, the accessories really glam it up! What a cute casual look on you. Your belly is so cute. I hope you are taking lots of pictures. Love your maternity style Rachel! Love this casual everyday outfit! Love this casual look! You are just glowing! Beautiful outfit! I own similar shoes but I really need that bag! So cute! You are looking amazing! LOVE the booties! love this casual look! The best part is that I already have similar pieces in my wardrobe already so I can totally create this. Thanks for the inspiration!